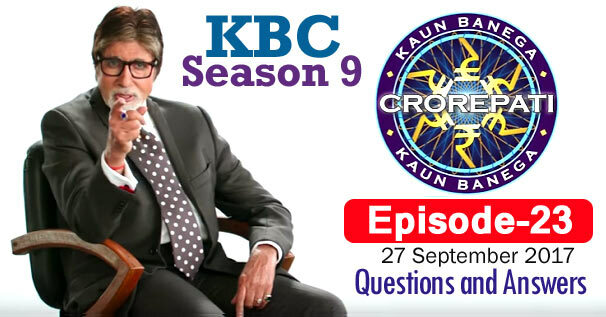 KBC Season 9 Episode 23 Questions and Answers: The twenty-three episode of Season 9 of Kaun Banega Crorepati (KBC) was telecast on 27th September 2017. In which Amitabh Bachchan had asked contestants 10 questions of General Knowledge. The correct answer to all the questions is given below each question. By reading these questions, you can prepare yourself for the next KBC Season 10 of Kaun Banega Crorepati. Because by reading these questions, you will understand what kind of questions asks Amitabh Bachchan in KBC. These all general knowledge questions will be helpful to for you various Competitive Examinations and Interviews besides KBC. Remember, the answer to some question may be in accordance with that time, while the answer to those question may differ according to the present time. 2. 7 April 1948, the day the constitution of WHO came into force, is celebrated by what name ? 3. Apart from Bihar's capital Patna, the name of which state's capital starts with the letter 'P'? 4. Which of these is an electric-automobile manufacturing company named after a Serbian-American inventor? 5. Who among these leaders has served thrice as prime minister but never completed a full term in office? 6. In the Ramayana, on Ravana's orders, who captured Hanuman when he was destroying Ashoka Vana? 7. Which of these does not hold true for mammals? 8. After Jyoti Basu, who has held the office of chief minister for the longest time? 9. Which Nobel laureate began his career as an accountant in the finance department of the Indian government in Calcutta?